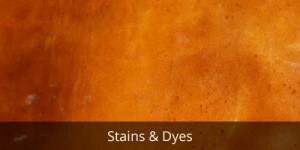 Stains and dyes are are used to color indoor and outdoor concrete. They are very popular with decorative concrete, stamped concrete projects. Coloring concrete with a stain is a simple way to add color and protect the surface. Water-Based Concrete Stains: Sealant Depot carries water-based concrete stains that are environmentally friendly. They will add color to any unsealed concrete surface. Acid Stains for Concrete: Concentrated Acid Stains are reactive concrete stains and can be used on interior concrete as well as exterior concrete projects. 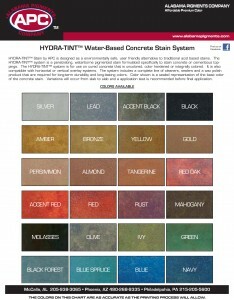 Dyes for concrete are designed to create a mottled look similar to an acid stain. If used on a floor, a decorative concrete dye can resemble a glazed stone or even marble - concrete dye colors are combined to create a marbling appearance. The dyes can be used on any cement surface including polished concrete. 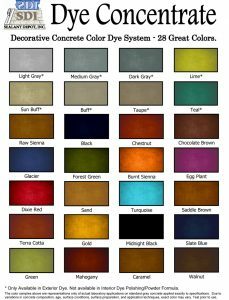 Our concrete product specialists can help you identify the stains and dyes suitable to color for your concrete project. Contact us or submit your question to ask our Decorative Concrete Specialist about concrete supplies needed for an indoor or outdoor stamped concrete project. Contact Sealant Depot for more information on which stains or dyes to use for your concrete project.